It's interesting to review previous bear markets and parallel with what we are in today. I've compared what started in 1906, 1929 and 1968 then compared it with what we see today which actually started in August 2000. What is compelling is that even with the 'recovery' we are in if one looks in real terms we are 41.3% lower than where we were in 2000. Also it is obvious that we still have plenty of time for the recovery not to be locked in and the market can head to lower lows in real terms. Indeed. It's sometimes amazing how much inflation really does disguise. Even though you are comparing returns against previous bear markets it could actually get much much worse as the comparison is an example of survivorship bias - you are looking at bear markets in what has been the most successful stock market in history. And a sample size of 3 bear markets will hardly be statistically significant. Many stock markets have effectively gone to zero whether due to war (Germany, Japan), revolution (Russia) or just bad government (Argentina). One study has shown that about half of global stock markets had a negative real rate of return, excluding dividends, over the period 1921 to 1996. I'm not predicting that this will happen in the US or UK markets but it is certainly in the realm of possibility. Also a broader look shows that the idea of 16 or 18 year bear market cycles is fantasy. Stock markets are just as likely to continue to go down after an extended bear market. There is a table somewhere I cannot find right now, but bear markets last about 20 years. The cycles jump from paper assets as outperforming, and then to commodities outperforming. Sure commodities have fallen from their 2007 highs, but paper assets during this cycle can go to zero whereas commodities can not. "The period of the return of your capital, not the return on you capital". It is unlikely equities will make any real return until 2020, even if the DOW is at 40,000 by then. My point is you are looking at the best case in history to come to this conclusion. There is no law of nature that stocks will end their bear market after 20 years. They can, and have in many cases, continued to fall to zero. That said, if the S&P 500 falls 75% and has a cyclically adjusted PE of 5 I will definitely be buying call options (leaps actually). Agreed. 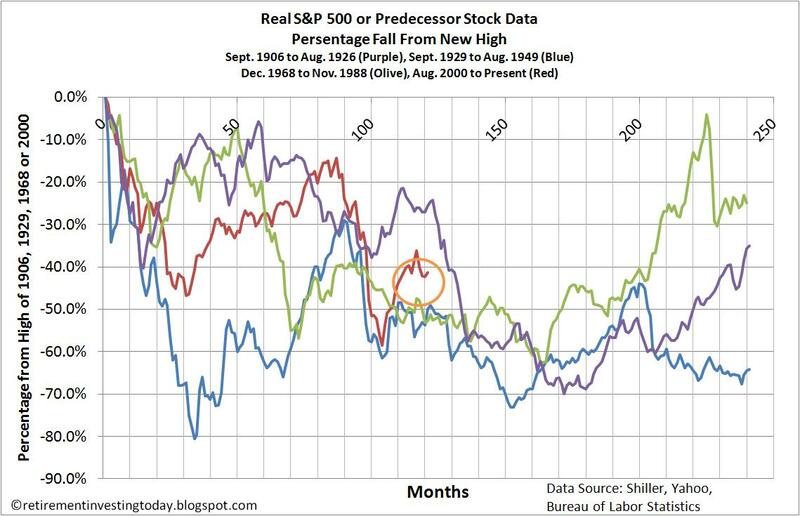 I have focused only on the S&P500 (or its predecessor) so a US bias. Those three bear markets are the worst for that index with what we are currently in amongst being the fourth. Have a read of the link I provided in the first post. It details exactly how long the downturns lasted for the 3 severe bears that I have reviewed. DOW could be at anything by 2020. One of the biggest factors IMO will be how much inflation can be engineered. It's just a number and has no bearing on genuine returns to buy and hold equity investors unless you correct for inflation as I always do. A PE10 or CAPE (I don't use PE's personally as IMO earnings can be inflated for short periods) of 5 and I too will be backing the truck up.